BOISE, Idaho -- Federal authorities should negate an Oregon law requiring fish passage as part of relicensing for a hydroelectric project on the Snake River where it forms the border between Idaho and Oregon, a utility company says. 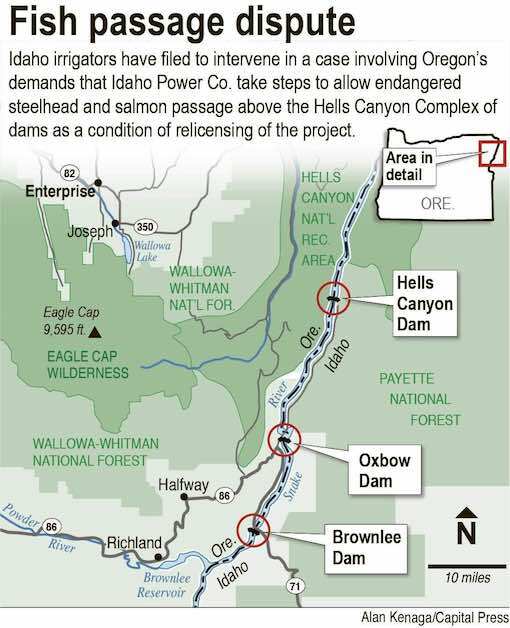 Boise-based Idaho Power in a notice made public last week asks the Federal Energy Regulatory Commission to exempt the three-dam Hells Canyon Complex from the Oregon statute. The company in the 28-page filing said the Supremacy Clause of the U.S. Constitution that has to do with federal authority over states pre-empts the Oregon law. "We're kind of stuck in the middle," said Idaho Power spokesman Brad Bowlin. "This is really an issue that needs to be resolved." The commission is taking comments through Dec. 30, and Idaho Power has asked the commission to make a decision by Feb. 1. However, Bowlin said the company hopes to get those certifications from each state later this month, starting a 60-day comment period in Oregon and a 45-day comment period in Idaho. Additional environmental review work would be needed, possibly leading to a new license in 2021. The company is hoping for another 50-year license. "We've really worked hard to come up with what we think is a workable solution to those other issues," Bowlin said. "We really don't want the fish passage issue to stand between the work we've completed at this point and getting a final license." But Idaho is against reintroducing salmon and steelhead above the dams, a point noted in a July 19 letter from Idaho Gov. C.L. "Butch" Otter to Oregon Gov. Kate Brown. "While I appreciate Oregon's willingness to limit these reintroductions to Oregon tributaries, the agreement would result in reintroduced fish entering Idaho waters," Otter wrote. "Such occurrence would violate long-standing Idaho law and policy opposing reintroduction of any species without the express consent of the Idaho State Legislature and executive branch. Based on state law and in part on our past experiences with reintroduced species (i.e., wolves), Idaho cannot and will not, agree to the reintroduction of salmon or steelhead above Hells Canyon Dam." The Oregon governor's office said Brown wasn't available to comment Friday. Idaho Power, as mitigation for the dams, traps adult fish at the base of the complex and spawns them in hatcheries. The young fish are then released below the dams. The company each year releases about 1.8 million steelhead, 3 million spring chinook and 1 million fall chinook. Celeste Miller, spokeswoman for the Federal Energy Regulatory Commission, said the commission doesn't comment on pending items.